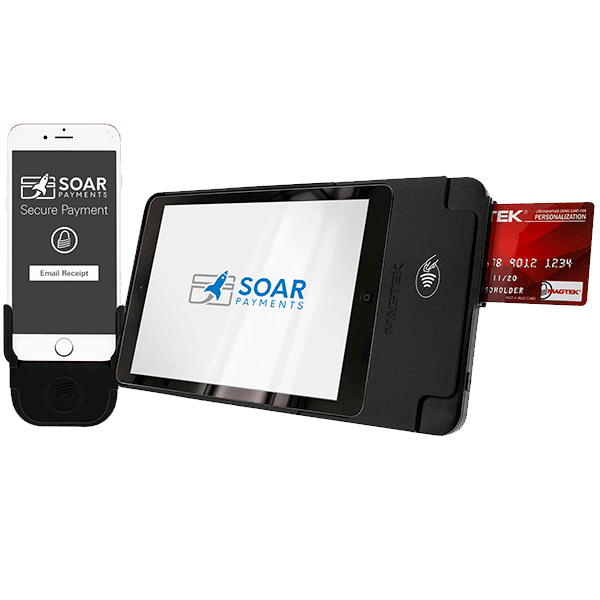 SoarPay is the #1 merchant account for moving and transport industry businesses. SoarPay Is The #1 Choice For Moving Companies. Most credit card processors consider the moving and transport industries as too high risk to support for any of four reasons: First, movers and transport services offer custom one-off high ticket items. For example, even the average office move or small boat transport involves a custom pricing proposal in the thousands to tens of thousands of dollars. One-off high ticket credit card sales are the most prone to so called “friendly fraud” in which customers use the service, but charge it back, to try to get it for free. Second, moving or transporting goods can be risky. Things get broken in the ordinary course of a move, or a customer’s goods aren’t delivered in exactly the precise way it was planned. Unfortunately, this leaves more room for disputes by customers, which creates the risk for more chargebacks. Third, even those carriers which are affiliated with major national moving chains, are often operated on a local or franchise model. These are small or mid-sized businesses, with significant chargeback liability exposure, and often without the resources to make good on orders in the event of a disaster. 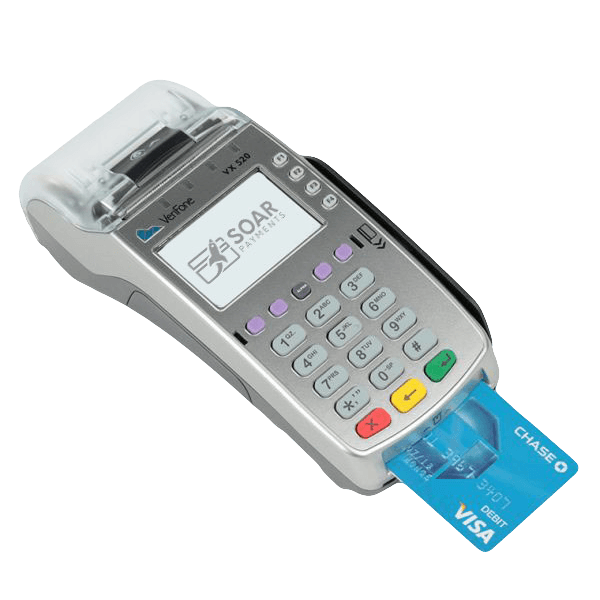 Finally, transporters often accept credit card payments via virtual terminal, over the phone. Because this method of card acceptance isn’t face-to-face, it’s also subject to more outright customer fraud than retail transactions. Combined, these four reasons lead many merchant service providers to reject all moving and transport companies, despite the fact that the vast majority of moving and transport businesses are excellent, well-operated companies. By contrast, Soar Payments has been proud to accept moving and vehicle transport businesses since our company’s inception. Our partnerships with credit card processors who are comfortable underwriting businesses with high ticket chargeback risk exposure, combined with our integration of fraud and chargeback prevention technology, uniquely positions Soar Payments to provide movers and transporters with reliable and affordable merchant services solutions. 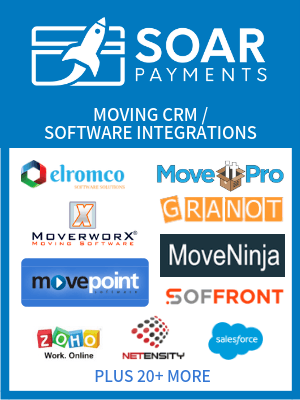 Elromco, Move Pro, MoverWorX, Granot, MovePoint, MoveNinja, Soffront, Netensity, Zoho CRM and Salesforce. 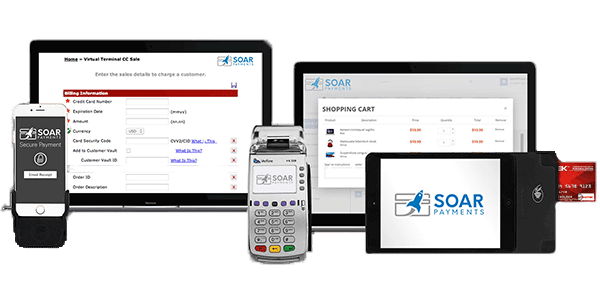 Soar Payment’s moving and transport merchant accounts can be also integrated with most other software or CRM platforms which are compatible with the Authorize.net, NMI, or USAePay payment gateways. Don’t see your preferred software? For questions about how to integrate your preferred moving and transport related CRM software, contact our sales team. A retail merchant account for movers and transporters enables your business to accept face-to-face credit card payments via a traditional credit card machine or point of sale system. Suited for companies that accept payments primarily in-person in their storefront location, a retail account requires reliable internet access. Due to the in-person nature of the transaction, retail credit card payments have lower rates of chargebacks and fraud, and therefore these merchant accounts receive the lowest pricing. Common in the moving industry, mobile merchant accounts allow your company to accept in-person payments via a swiper that plugs into your employees’ mobile phone or iPad. Moving or transport companies that accept credit card payments at the customer’s location are ideally suited for a mobile merchant account. Because payments are accepted in-person, the fraud and chargeback risk is lower and consequently these merchant accounts are priced similar to retail. A virtual terminal or payment gateway merchant account, allows businesses to accept payments over the phone, via mail, or typed into a regular computer with no outside equipment. A payment gateway merchant account is ideal for movers and transporters that prefer to accept credit card payments over the phone, or who use a robust CRM system, and prefer their payments to integrate automatically with that CRM system. 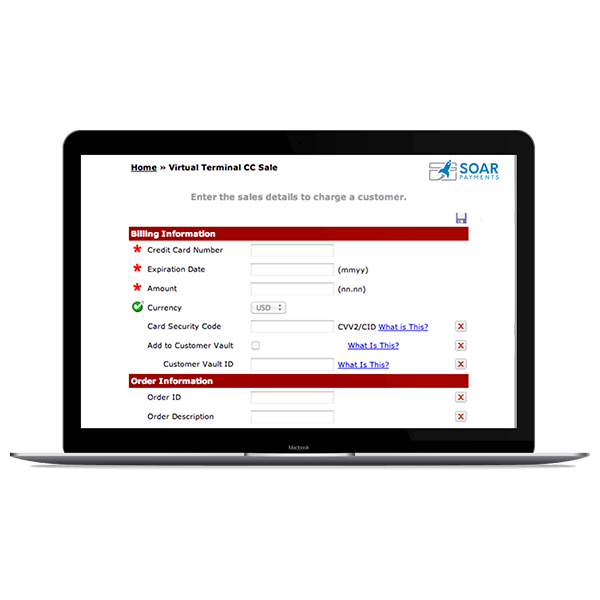 Virtual terminal payments are, however, subject to increased fraud and chargebacks, and therefore, Soar Payments offers pre-integrated chargeback prevention technology. Online merchant accounts for movers and transporters allow your company to accept credit card payments via a website checkout page. Our eCommerce accounts pre-integrate with most major payment gateways and website shopping carts, making setup easy. 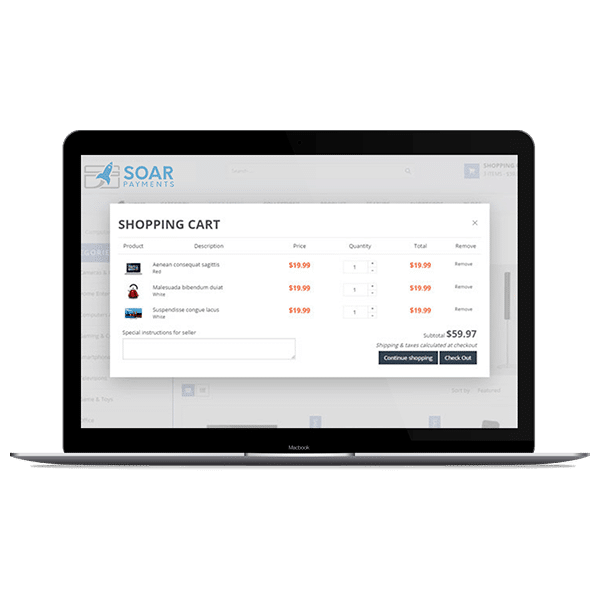 eCommerce sales are vulnerable to customer chargeback and fraud risk, and therefore Soar Payments offers integrated chargeback prevention technology. What types of transport industry businesses do you accept? 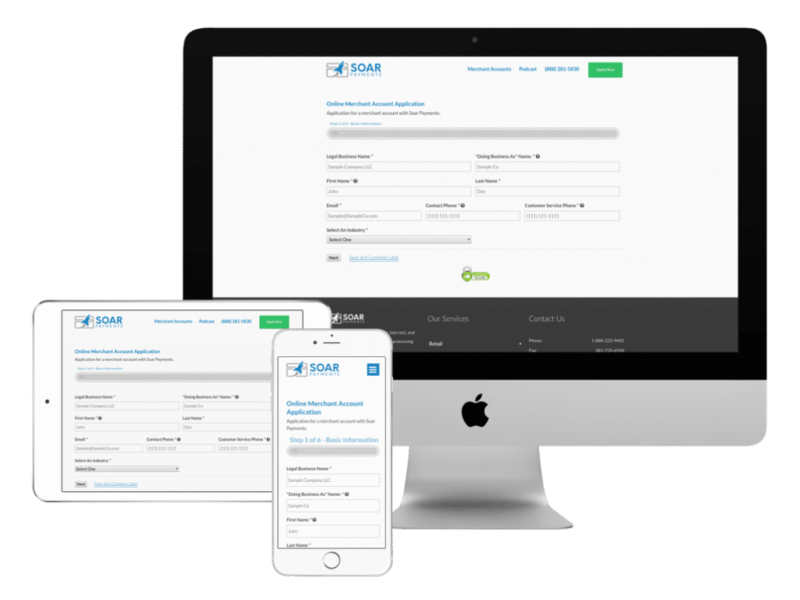 Soar Payments accepts a broad range of businesses within the broader moving and transport industries. These include traditional home and office movers, booking agents, carriers, local and long-distance transportation companies, high value transporters, auto transporters, PBO transporters, van operators, logistics and warehouse companies, web and app based technology companies, and many others. Can I charge my customers’ credit card before the move occurs? Each merchant account is approved based on your specific company’s needs. Generally speaking, however, it’s best practice to only charge a customer’s credit or debit card as close to the day of the move as possible. Charging a card early leads to unnecessary customer credit card chargebacks in the event of a last-minute change by the customer. What chargeback and fraud protection technology do you offer to protect my business? While we offer the full range of chargeback and fraud prevention technology to every client, moving and transport businesses face a very specific type of chargeback risk, and therefore we offer some customized solutions. Movers and transporters need to have a system in place for connecting the credit card transaction to the specific terms and conditions of the move. For example, the date that the goods were to be delivered, that the customer was declining insurance coverage, etc. Tying these terms to the credit card transaction ensures that the customer can’t later claim that they didn’t understand the terms of the agreement when making payment and on that basis initiate a chargeback. To address that vulnerability, we offer moving and transport companies the use of specialized technology which positively identifies the signatory (so the customer can’t claim it wasn’t them who signed) and then has the customer indicate that they understand all of the terms and conditions of their transaction before completing their credit card payment. Not only does this minimize moving and transport chargebacks from starting, but those disputes that do occur are far more likely to be won by the moving company. Is there a transaction ceiling for moving and transport merchant accounts? We let you tell us how much your company’s services cost in your merchant account application, and when an underwriter reviews your business’ merchant services application, it will be reviewed with that transaction ceiling in mind. There is no fixed transaction ceiling for the moving and transport industry as a whole.